Rae Lewis-Thornton: Diva Living with AIDS: RLT Reads Book Club Up-Date! 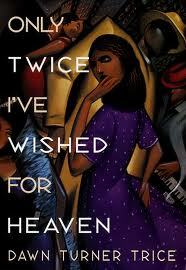 The current RLT Reads Book Club pick, Only Twice I've Wished For Heaven, by Dawn Turner Trice, is a wonderful read that I discovered well over 12 years ago!! In 1975 Tempestt Saville and her family are chosen by a lottery to "move on up" to Lakeland: one square mile of rich, black soil carved out of a Chicago ghetto, cradling, sparking apartment towers and emerald laws, where the elite of black professionals live in privilege, secure behind a ten-foot-tall ivy-covered, wrought-iron fence. This generation of blacks, only once removed from salt pork, fatback and biscuits, now dines on caviar and escargot. Please join RLT Reads as we dive into the newest book club pick. The author, Dawn Turner Trice has agreed to sit in on our on line book club discussion. We are still waiting to confirm a date. Please START reading, the date will be early February 2012. The book can be purchased at Amazon HERE.